Adults usually do not exceed 50–60 cm (about 20-24 inches) in length. The maximum length recorded is 66 cm (26 inches). The color pattern consists of a gray, bluish gray, brownish gray, or medium to reddish brown ground color, usually with a fine brown speckling. This is overlaid with a series of dorsal blotches that tend to be divided down the median line to form 39-64 pairs. The specific name, pricei, is in honor of William Wightman "Billy" Price, a field biologist, who collected the first specimens which became the type series. Twin-spotted rattlesnake, western twin-spotted rattlesnake, Price's rattlesnake, Arizona spotted rattlesnake, spotted rattlesnake, Arizona twin-spotted rattlesnake. This snake is found in the United States in southeastern Arizona. In northern Mexico it occurs in the Sierra Madre Occidental in Sonora, Chihuahua and Durango. 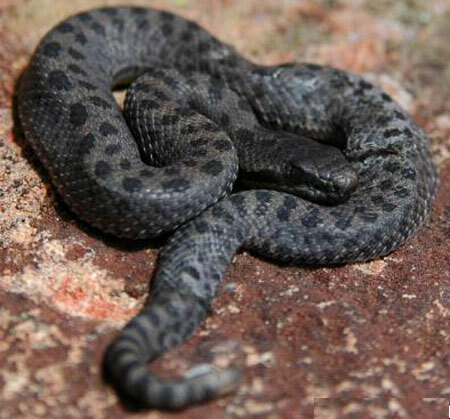 It has also been found in the Sierra Madre Oriental in southeastern Coahuila, Nuevo León and Tamaulipas, with isolated records in San Luis Potosí and Aguascalientes. The type locality given is "Huachua Mts., Arizona" (Cochise County, Arizona, USA). This species is classified as Least Concern (LC) on the IUCN Red List of Threatened Species (v3.1, 2001). Species are listed as such due to their wide distribution, presumed large population, or because it is unlikely to be declining fast enough to qualify for listing in a more threatened category. The population trend is stable. Year assessed: 2007.